The yacht Jessie Logan is the oldest ‘purpose built gaff rig’ racing yacht in the world and is still racing to this day ‘purpose built for racing’ sailing boat in the world and is based in Auckland, New Zealand. She was built in his Devonport waterfront yard by Robert Logan Senior in December 1879-January 1880 to compete in the Auckland Anniversary Regatta on 29th January 1880. Robert Logan, the founder of the famous Logan dynasty of yacht designers and builders, had arrived in Auckland in 1874 from the Clyde as a highly experienced yacht and boat builder with his wife and young family. Within five years he had set up on his own with a yard on the waterfront at Devonport close to what was then called the Flagstaff Wharf. Logan’s sons were all excellent craftsmen and sportsmen and all eventually worked in the business known as Logan Bros which produced the finest yachts of its time in the southern hemisphere and whose yachts dominated the racing in, not only New Zealand, but also Australia and South Africa. Named after one of his daughters, Jessie Logan was built as a private venture to show what Robert Logan could do in Auckland’s most hotly contested race of the year. 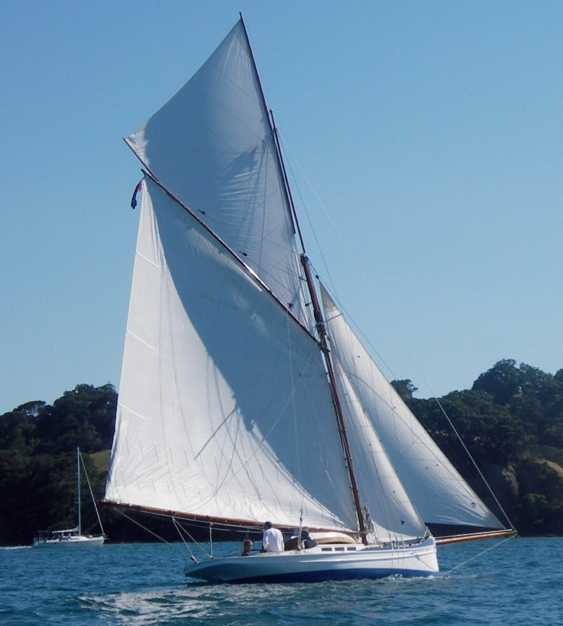 She was built as a radical for the time 28ft 6in centreboarder of two skins of kauri, laminated in diagonal fashion and built without frames in a form of construction that became standard for New Zealand yacht builders for two generations after Jessie Logan. Jessie Logan was launched from Devonport on 24th January 1880 and immediately became regarded as a “freak”. Logan sailed her to win by far the most fiercely-contested and interesting race of the day, the 2nd Class yacht race for yachts under five tons. Under Logan and series of later owners Jessie Logan completely dominated the racing in Auckland until 1889, particularly after she was bought in 1886 by Walter Jones, a young man from Herne Bay who was the crack amateur skipper of the time. Jones spent his short life as a departmental manager at L.D. Nathans and Hancocks Hotels, a Lion Nathan precursor company. In late 1889 Walter Jones sold Jessie Logan to Wellington owners. Up to that point she had been beaten in Auckland only once and that was clearly when the skipper “pulled” her to win a bet! Jessie Logan was again very successful in Wellington despite her real unsuitability for the Wellington Harbour with her low freeboard, light weight and extreme rig. In January 1892 she was sold to Nelson where she was raced for another thirteen years under progressively reduced rigs. By 1905 she had become outclassed and was converted to a launch. She then spent the next 75 years in all sorts of menial tasks as an oil launch, after 1918 servicing soldier settlements and taking children to school in Pelorus Sound, for example. Adrian Hayter, the famous yachtsman and circumnavigator used her for fishing out of Nelson for some years. In the 1980s she came ashore in a storm at Nelson and became badly damaged. She was rescued by the Winter family who transported her to their house in Stoke where she was used as a playhouse for their children. Harold Kidd and Keith Pine brought Jessie Logan to Auckland. Eventually Keith Pine’s dental company paid for restoration to start, but it was very difficult to get accurate details. There were only two known photographs of the boat during her heyday as a racing yacht, neither of which was particularly helpful for scaling purposes. Nevertheless restoration did proceed and she was launched from the Devonport Yacht Club on 24th January 2001. Paradoxically, just days before she was launched, Harold Kidd identified a very large number of uncaptioned photographs of Jessie Logan at the National Maritime Museum. These revealed that some of the restoration had been done incorrectly, in particular the rig was very much too tall, spars were too thick, fittings were too heavily constructed. After launching it became clear that the rig was in fact grossly oversize. To stabilise the boat, an extensive amount of ballast had to be put in the bilges. After three seasons of racing, some of it pretty hairy, it became clear that the rig at least would have to be replaced. David Payne of the National Maritime Museum, Darling Harbour, Sydney was given the brief to remedy the faults. His plan involves a complete set of new sails, a new centre board, the spars being cut down and new spar fittings made. At this point, Keith Pine’s company, effectively the owner of Jessie Logan, sold out and its new owners decided they would not continue with funding. They put Jessie Logan on the market. Harold Kidd got a group together and set up a charitable trust, the Jessie Logan Trust, to acquire her and keep her for posterity rather than let her continue in private ownership at the whim of commercialism. Jessie Logan was a landmark product of the early days of North Shore industry and craftsmanship. She will resume her role as a significant sight on the Waitemata. The Trust purchased Jesse Logan in February 2012. She has been successfully campaigned in the CYA race calendar.